Trainers can provide lessons that increase your skill level in their area of expertise in exchange for gold. You may train up to five times per level only, and trainers cannot raise skills past 90 - you must obtain the last ten points by using the skill, skill books, or from quest rewards. Sometimes it is beneficial to use only part of the total training allotment for each level. Because training counts towards the next level progression, training too much may cause the player to skip one or more levels, essentially wasting those training sessions. Saving the game before training can allow the player to train the maximum number of times without going over. The best time to train a skill, to provide the maximum increase to your overall character level, is when you have levelled up to the next level. Angi will offer you free practice at her home. You can increase your Archery skill by up to six levels if you accept. It is possible to max out Archery to 100 if you accept the quest with an archery level of 94. The list of trainers in the Official Game Guide incorrectly identifies several people as trainers: Ahkari (Pickpocket), Hermir Strong-Heart (Heavy Armor), and Melaran (Alteration) do not provide training. The cost for having a skill trained is calculated using the below formulas, based on your current skill level (not the level you are going to). Price adjustment effects, such as speechcraft level, persuasion level, and enhancements such as Fortify Persuasion and Fortify Barter, do not affect trainers' rates. Where n is the number of times you wish to train and b is the current level of the skill. E.g. : If you wish to train a particular skill from level 20 to 50 (b = 20 and n = 50-20 = 30) the combined cost (250+260+270+...+540) would be 30(10*20 + 5*30 + 45) = 11850. Training benefits from Sleeping and Standing Stone bonuses, though the XP so acquired will never result in advancing more than one level. If you are ready to level up, but do not do so, the "Times Trained This Level" stat, accessible through the Journal, will not reset. Trainers that double as followers can train you for "free". They will still charge you, but you can get back the gold you spent by checking their inventory. This issue has been addressed by version 1.2.6 of the Unofficial Skyrim Patch; the exploit is no longer possible. All trainers put the gold you pay them into their personal inventory. If they are also merchants, then the gold in their personal inventory is added to the gold they use to barter with. However, most merchants have a cap on their personal gold which is put into effect when you enter their stores, so if you leave the store and come back later, the gold will have disappeared. 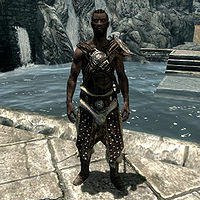 Notable exceptions to this are the merchant trainers added by the Dawnguard add-on. You can get back the gold spent on training if you pickpocket the trainer and steal the gold. That way, you will gain experience for Pickpocket and for the skill you trained, leveling up very quickly (Pickpocket will increase several levels at once if you steal a large amount of gold, but be sure of saving game before trying because your odds of success will be low). If you've spent so much money on training, maybe there will be too much gold and the odds of pickpocketing will be zero; you can increase it fortifying Pickpocket skill with potions, spells or enchanted gear. You can also bypass this by stealing the gold after every single session, instead of stealing it all after the five sessions allowed for level. Note that with the Unofficial Skyrim Patch the trainers that double as followers won't put the gold spent on training into their inventory, so you won't be able to pickpocket it from them. Gold can be pickpocketed back after training sessions, but this becomes impossible at higher levels (even with maximum Pickpocket and Sneak skills) as the amount of gold paid is often in the thousands. This can be surmounted by knocking down the trainer in some way, and then pickpocketing the gold back while they are on the ground. You can pickpocket anything in a knocked down NPC's inventory with no bounty, even if the chance of success appears to be 0%. To knock down an NPC, use Unrelenting Force with all three power words (or Ice Form), do a power attack with a two-handed weapon (you may receive bounty), or, with the "Poisoned" perk, reverse-pickpocket a paralysis poison into their inventory. It is possible to prevent a crime being charged against the Dragonborn by first joining the appropriate organization and then performing this on a trainer who is a fellow member (for example, the player can join the Thieves Guild and use this method on Vex or Delvin). Some trainers will continue to offer the dialogue option to train even if you've passed the skill level at which they can train you. Choosing this dialogue option in this circumstance will cause them to say things such as "You already know all that I know." If you have an active Fortify Skill effect, the cost of training will appear to be for the increased skill. However, the trainer will only take the price for training at your actual skill level. If a skill has some progress toward its next level, the training progress bar will fill and then empty. However, checking the Skills menu shows the initial progress was not lost. If a skill is at 0% progress to its next level before you start training it, a purchased level may fail to actually increase the skill even though you paid for it and it used up one of your five training opportunities This appears to be because training does not add all of the experience needed to fill up the bar completely, so the bar will not fill up sufficiently to trigger a skill increase in one training session if it is completely empty. You can use, for example, advskill block 1 to get your proper Block level. If you load a character which has used trainers since last leveling, and then quit to the main menu and start a new game, the game does not clear your new character's training stat and if you seek to use a trainer at level 1, you will be told that you have used however many training sessions the previously loaded character had used. This page was last modified on 6 April 2019, at 07:20.